For the fifth consecutive year, Sadler’s Wells is delighted to take part in the Get Creative Festival. From 11 to 19 May 2019, this national celebration will see hundreds of organisations and community groups across the country offer everyone the chance to try their hand at something new and creative in their local area. As part of the festival, we invite you to two free dance workshops at Sadler’s Wells: one for over 60s and another for young children aged 2-4 and their carers. Join Portuguese dancer and choreographer Clara Andermatt as she leads a fun, open session for over 60s. Learn and try out dance moves, with members of our Company of Elders at hand to show you how it’s never too late to be dancing! Inspired by our ever-changing artistic programme, Family Fridays is our monthly workshop encouraging young children aged 2-4 and their carers to dance together. Enjoy a special Get Creative Family Friday session led by professional dance artists, covering a range of dance styles and nurturing the little ones’ coordination, creative thinking and social interaction. Both workshops are suitable for all abilities. 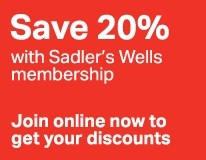 To book, please email learning@sadlerswells.com by Friday 3 May, specifying which workshop you wish to book for, your telephone number and the name of the person(s) who will be attending. Please note places are limited and will be allocated on a first come, first served basis. There is a maximum of 4 places per booking.